How Can I Tighten My Jaw Line? That little pocket of fat right beneath our chins – what a joy in photos!! Many of us spend the majority of our makeup desperately trying to conceal it with dark foundation and a contour palette. Now at Amara there is an easier way! Why do I look like I have a double chin in Photos? For starters it’s very unlikely that you have a double chin! A double chin is a large pocket of fat that hangs down below your regular chin making it look have you have two. Bad Lighting and camera angles can contribute to this greatly. Many women suffer with a loose pocket of fat right below their jawline making them feel like they have a double chin. This is also one area that cannot be exercised to lose weight – even with tremendous weight loss this pocket of fat can stubbornly remain. How Can I Tighten My Jaw And Remove My Double Chin? Under the neck and jaw is a very tricky area that usually we can just disguise with foundation and contouring, however now we can diminish the extra fat and loose skin with Radio Frequency. The Exilis Elite is an FDA approved skin tightening machine that uses Radio Frequency to improve our skin’s elasticity. How Does The Exilis Elite work? The Exilis Elite uses Radiofrequency to heat the areas it’s treating – the heat causes the muscles to tighten and contract and shrink the tissue. This is also known as collagen remodelling as it contours the face and neck. Where Can The Exilis Elite Be Used? 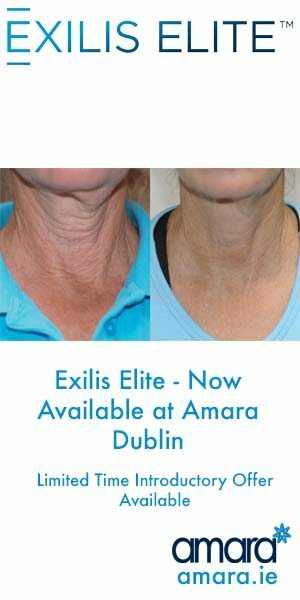 At Amara the Exilis Elite can be used on the full face including your neck and jawline. This tightens loose skin in the areas where we are most worried about like the neck, jawline, nasolabial folds and eyes. The most time can be focused on the are that you worry most about. How Many Exilis Elite Treatments Do I need to Look Contoured? Though you may actually notice a difference with just one treatment, a minimum of 4 is needed to make a true contoured look. Each treatment should be done within 7 -14 days of each other. This means that in just a month you could have a completely new jawline! Your optimum results will actually be seen 3-6 months after your last treatment – so it just keeps getting better and better! How Much Is An Exilis Elite Package? We recommend treating the whole face and neck for best results. We offer Free consultations to those unsure about what to get or if Exilis Elite is for them. For a limited time we are offering a Introductory Offer or up to 50% off the regular price! Book in for your Free Consultation Today To Get Contoured With No Make Up!